As much as I love to snuggle under a quilt, a staple item on our bed during the cold season is our great big fluffy down comforter. Mmmm...fluffy snuggly goodness. Not to mention the frustration of the comforter bunching up inside the cover. Or all the down migrating to one spot. One cover we bought came with ties at the corners - that you tied around the corner of the cover. Those worked pretty well - but the corners would slip out sometimes. And with the length of the sides, the comforter would still "slouch" and get bunched up. When I made a duvet cover for the Munchkin's bed (we got a little down throw for free when we bought our king size comforter, and it is a perfect size for him), I got the brilliant idea to sew ties not only on the inside of all four corners, but in the inside center of each side of the cover. I then added fabric loops with grosgrain ribbon scraps to all four corners and the center of each side of the comforter (not planning on ever using it uncovered, so it did not matter cosmetically). I recently went back and did the same for our king size cover. It makes putting the cover on so much easier, too. 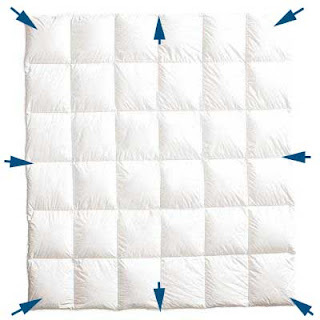 Simply turn your cover inside out, and lay your comforter on top. Tie up all the ties to all the loops. Then reach inside, pull the top corners through the bottom, shake it out and button up the opening. No twists, no bunches, and if your down shifts it makes it easier to grab and shake without really disrupting the whole insides. And it turned what was a 2 person job into a one person job. I can't show a picture of what I am currently working on - because it is part of a gift and I don't want to ruin the surprise. I've been working on this since March - and have managed to keep the secret this long... which is stellar for me. Usually I can't last that long. Anyway - the project involves appliquéing hearts on quilt blocks - lots and lots of hearts. 42 blocks - 42 hearts. Gold and red hearts blanket stitched with contrasting gold or red embroidery floss. 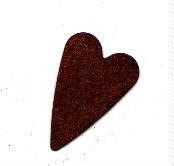 The hearts were easy to cut - which is why I decided against mixing hearts and stars, which was my original plan. Stars were just too fussy to cut out. 4 hours and 2 stuck fingers later - I have 30 of 42 done. Enough to assemble the quilt part of this project (it is a quilt and 4 wall hangings). Ya Gotta Have Heart, right!?!? Sorry folks - the Phoenix Mystery Quilt was temporarily grounded this week while other stuff got taken care of (sunny day = clean up the yard for winter) - I hope to be back on track next week with the next step. As I struggle with a 3 1/2 year old who is telling his Halloween loving mother that he wants to be "just a boy, Mommy" and that "we don't need Halloween, Mommy. It's not a good idea" -all while every creative gene in my body is screaming to build him the best Halloween costume ever - I remember back to the Halloween's of my childhood. 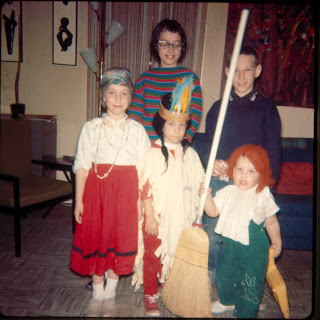 We had a big orange trunk in our family room - it did not contain toys (they were in a different toy box) but was filled with all sorts of costumes. 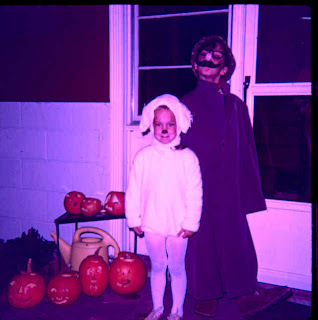 Most were dance costumes from my older sisters - there was a gypsy and I think a peacock of some kind - but others were fun Halloween costumes -the sheep (see cute little me over there as the sheep), the brown dog - and I know there were more. Each year we would delve into the trunk - seeing what fit who, or what could be adapted, embellished, altered or enhanced to create whatever our imaginations came up with that year. No store bought costumes around our house - but we had some great ones! Gypsies, ghosts, and other such elegance. 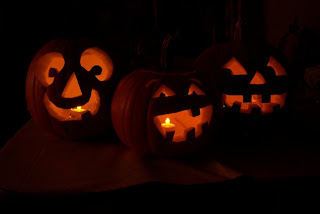 That and lots of jack-o-lanterns out front, with lots of pumpkin seeds roasting in the oven - YUM!!! I also remember the years big brother Rick decided to rig up some speakers and a microphone and be the spooky noises at the front door. We really did not get a ton of trick-or treaters at our house - mostly kids who lived in the few houses around us on our rural road. 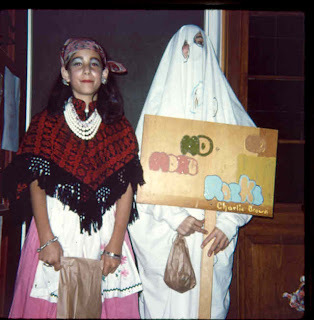 Costumes were frequently covered up by coats and hats and gloves - and had to handle getting in and out of the car frequently as Mom and Dad drove us around to more houses. I can live with the Munchkin going trick-or-treating as "just a boy" - his box of costumes and spark of creativity may yet still come. My only dread is that come Halloween morning that he does not suddenly decide he wants to be something more complicated than "just a boy, Mommy." 63 days until Christmas - and although I have only one item left on my list of things to "buy" - my list of things to make includes all to many that are not yet "done"... I started early this year - and more ambitiously - I might add - but it's still creeping up on me. 36 more days until Thanksgiving -not so pressing but I want to give one Christmas present at Thanksgiving, so that's at the top of the pile. 9 more days until Halloween, and I still have not convinced the Munchkin to wear a costume. which is to stitch 8 of your "sweet sixteen" blocks together to form this horizontal "checkerborder"
You will end up with 2 of these strips. If you've been good on your seam allowances, they should be basically the same width as the Eye Block strips. I came across this little guy as I was out with the camera one afternoon. 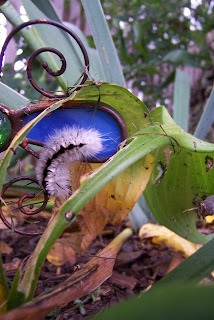 I don't recall ever seeing a caterpillar quite like this one before -so I had to do a little research to find out what he was. Turns out he is a Hickory Tussock Moth caterpillar - likes to munch on black walnut leaves - which explains his presence in this bed under the tree. He really loses his glamour when he transforms, as you can see in these photos of the moth. Turns out he is also well protected - as handling him can cause a poison ivy type rash. They call this type of caterpillar a "stinging caterpillar." Glad I kept my hands to myself! I don't do well with sun glare - it makes my eyes all squinty and watery, which is perfectly awful if I am trying to drive. I wear a pretty strong prescription as well, and cannot drive (or do much else really) without my glasses, so my prescription sunglasses are always close at hand. Most days forgetting my sunglasses would not be a huge issue, as Hubby and I carpool and he usually drives, but today I had to work late so I had to drive my car. And I had left my sunglasses in Hubby's car. Of course I realized this just as Hubby and the Munchkin pulled out of the driveway, along with the one pair of oversized sunglasses that does fit over my regular glasses. Then I opened the door to my car, and there centered on the console was my sunglass case - which Hubby had thoughtfully put there before heading out. 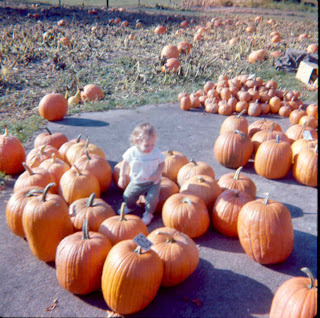 We always went there to pick out pumpkins - they even had groups from school go there if I remember correctly. 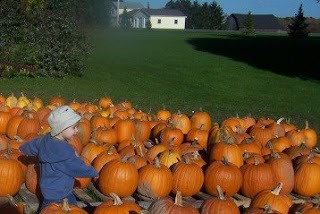 The Munchkin, age 1 1/2, picking out pumpkins at Hellaby Hill, Scottsville NY. I loved watching him run up and down among the rows of pumpkins, the blue sky matching his blue sweatshirt. He would stop next to the biggest pumpkins and reach over and just barely touch the tips of the stems, saying "wow"
This year we have pumpkins grown by my neighbor. Which one did the Munchkin pick??? The one that never turned orange - he calls it "the black one" (it is dark green). Just a little bit "corny"
When I started figuring out prizes for my 300th post giveaway, my son had just discovered Candy Corn, and I had just discovered these fun baskets from the Pink Penguin. 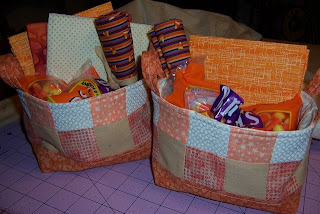 I knew I had lots of cream and white and orange in my scrap bin, so I decided to make baskets completely from scraps, and then add in some "candy corn" themed prizes. 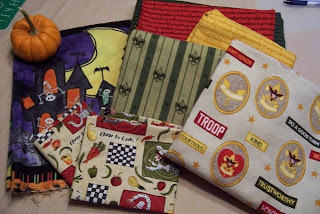 On the left is Lazy Sister Sue's first prize - a FQ of candy corn fabric, 3 FQ's in candy corn shades and a bag of Brach's Candy Corn. Colleen's 2nd prize on the right is the same, but with only 1 FQ. The baskets don't have the candy corn yellow in them - because all my yellows were either used up in the Summer Sunshine quilt, or were way too bright for the oranges I had. These were held up in shipping due to the post office holiday for Columbus Day, but I hope to get them on their way later this week. ...I should have included toothbrushes? Due to the wonders of math, I discovered that six Eye Blocks, sewn together, are just the width I was hoping for to turn Phoenix into a nice lap quilt. 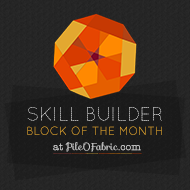 So today's step is to take those 18 eye blocks and stitch them into 3 rows of 6 blocks each. After realizing that my son has suddenly had a growth spurt and is showing off a bit of ankle in all his pajama and "lounge" pants, I decided to finally follow some of those online tutorials I have seen for making your own lounge pants by tracing a pair that fits. I found a good fitting pair waist wise in his dresser, added a bit of length, made a pattern, and set to sewing. 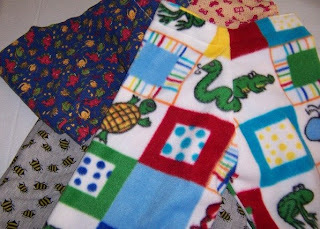 I had found the dinosaur waffle knit and the turtle/animal fleece on the super duper clearance rack, so each pair cost me about $2. Of course I could not sew just for the Munchkin, so the butterfly pants were my "fitting experiment" and then when figured out that I had the right measurements, I cut into my bee fabric. Those are lacking only the elastic. These are fun, easy and addicting -and I know there is green turtle fabric just waiting at my local JoAnn's for my next coupon or the next sale. 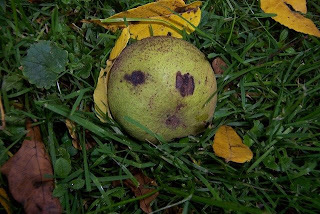 When you have a backyard with four black walnut trees -this is a common sight. One of these years we will get ourselves motivated and actually process these and have some black walnut cake. But for now the squirrels, and the "freecyclers", are happy. When I first looked at the pattern for the AeroPacs, I thought they were pretty cool - but I was a bit apprehensive about all that bias tape - especially since I was multiplying it by 12. So true to my typical form - I changed the pattern a bit. I cut all the pieces about 1/2" wider than the pattern indicated. On the angled pockets I topstitched for stability instead of adding bias binding. On the straight pockets I used Velcro Fusion so I could just add it in later. I created a strap from 2" wide fabric - pressing it in half, pressing each side in, and then stitching once down the middle. I basted the top velcro flap to the top of the front, and the angled pockets to the side of the back. To assemble, I pinned the strap in place at the top front, about 1/2" in from each side, and then lay the back on top of it, wrong sides together. I started stitching at the strap, back-stitching for strength, and stitched 1/4" all the way around. I trimmed with pinking shears and turned right side out. After pressing I top-stitched just along the top edge of the pouch to close the seam allowance. No bias binding, no fuss, no muss, no bother - just a bit more bulk at the sides. I would do it again this way. OK - so I had 12 Aeropacs and 2 rather large quilts ready to take to Leadership Institute, and was still faced with a pile of scraps. This is when my brain gets dangerous - when I get on a creative roll like this - because then I started thinking about quilting, specifically scrappy quilting, being kind of like leadership sometimes - you get lots of different fabrics/people with different looks/strengths and have to put them together into something functional - like a quilt or an organization. And many times you may have a pattern in mind, but the pattern changes depending on what you have to work with. I even asked my participants which came first - the pattern or the fabric -and which of the quilts was made first. It made for an interesting discussion. 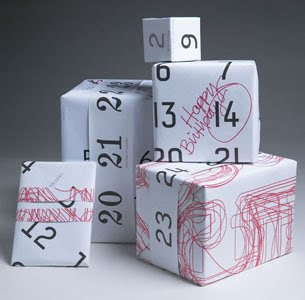 So I decided to illustrate this - and make all those scraps useful. 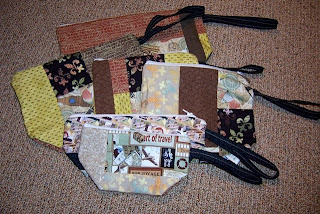 I started sewing "Perfect Pouches" and when I ran out of pieces big enough to make those, I started sewing the little scraps back together and making more pouches. Big pouches, little pouches - pouches with Handy Tabs, pouches with handles. My goal was to use up all the scraps. 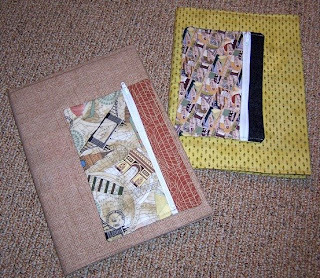 I even made 2 journal covers with Perfect Pouches on them - one for my assistant coordinator, and one for me. I pouched until I ran out of zippers and found that I had one for every participant to take home with them. And I still have some leftover scraps!!! 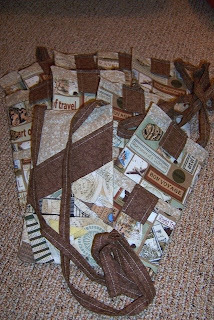 So yesterday I started to tell you about my overabundance of travel fabric. Well, as I worked on my dozen AeroPacs, my mind got into that "dangerous" zone where I was figuring out ideas for the Leadership Institute and how the whole theme and event were going to come together. I decided in keeping with the travel theme I would issue the participants "passports" -and as a bit of incentive we would "stamp" those passports and then raffle "something" away at the closing banquet. 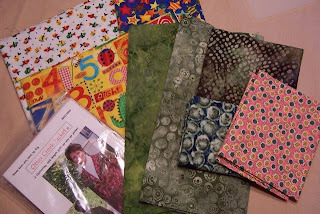 Hmm - after looking at what I bought and finishing up the AeroPacs, I thought I probably had enough leftover fabrics to make a quilt to give away. So I made a Yellow Brick Road. Not my favorite rendition of this particular quilt - but it worked for the purposes of the program - and was easy and quick to assemble and tie. But - I STILL had lots of leftover fabric. Hmm - perhaps enough for a second quilt?? Yup - this one was a "make it up as I go along" pattern - trying to use up blocks already put together. I was able to make them exactly the same size. I actually like the 2nd one better, although with more time I might have done things differently. I decided to raffle off one quilt among all the participants, with their number of chances based on the number of passport stamps they received, and to let them choose which one they wanted. The second one would be drawn from the names of the faculty, staff and participants, with each person getting one chance. One fabric is being withheld to keep it secret - and the pen is still packed away in the stash of stuff from last weekend, since it was used to sign the quilts. Oh - and the pumpkin was already here. My little clock is telling me that it is 2:30, so time is up on my 300th Post Giveaway Game. The 11 guesses ranged from a low of $51.62 to a high of $110.22. Four people were within $10 in either direction, two were within $2.00 - and one was only off by $0.48!!! Um - I actually went over my budget - but thanks!!! So the winner of the Showcase Showdown and the whole shebang is my own lucky guessing, soon to be a little bit older (Happy Birthday on Friday!) Lazy Sister Sue!!! But -since the close relationship of the winner to me could hint the teeniest tiniest bit at the whole thing being fixed, a second prize will be awarded to Colleen - who was only off by $1.50. And Sister Cindy - for a non sewer you came in pretty dang close -must be the sisterly thing?!? I am headed to JoAnn's on Saturday to pick up the last couple pieces of the prize package(s), and will post a photo then. And the photos of all my loot? In the camera, in my bag - my other bag -the one I left at home today. and yes, that DOES include the tax!!! So last week I was AWOL from the blog because I was at our Lions Leadership Institute. This is an intensive 3 day leadership training retreat for Lions Club members in New York state. I was a participant in this retreat in 2003, and for the past 4 years have been on the coordinating staff, holding the position of Chair this year and last. This year we had 17 participants, 4 mentors, 5 faculty members, 2 staff members and an additional 7 guests at the closing banquet. Coordinating this event means my assistant and I publicized it, recruited participants, processed applications and payments, made hotel arrangements, planned the meals, recruited faculty, built the schedule, purchased and prepared all the materials AND hosted a hospitality room. Oh, and we were present for every workshop and I was master of ceremonies for the banquet. But that's the "work" part of this - the fun part is coming up with the annual theme and all the little things to go with that. Last year it was a Lion Safari, and this year we went on a Trip Around the World. 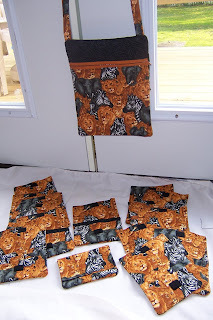 So the crafty side of me decided that buying things for props just was not good enough - last year I made Lazy Girl Wonder Wallets in safari fabric for all my faculty (instead of framed certificates) and carried around a Runaround Bag with the same fabric. This year I decided to make them Studio Kat AeroPacs. Until February - when a trip to JoAnn fabrics showed me the debut of new fabric lines by M'Liss Rae Hawley - including a great travel fabric line. So I bought a little. I kept forgetting to bring the pattern with me -nor did I know exactly how many I needed to make - so next time I was in the store I hedged my bets and bought a little more. 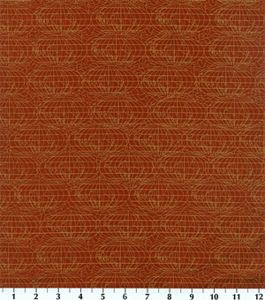 And the next time I was in the store, knowing this was a JoAnn's exclusive fabric and might also be time limited - I hedged AGAIN and bought a little more, each time buying a bit of one of the other fabrics in the line. This happened more than a few times. By the time I sat down to start making the AeroPacs, I realized I had WAAAYYY more fabric than I needed. What's a girl/quilter to do with too much fabric for an intended project??? Expand the scope -that's what. And that's exactly what I will tell you about - tomorrow - when I can load in the photos to go with the rest of the story. Remember those 72 four-patch "cobblestones" we made a couple of weeks ago. Now it is time to turn those into "sweet sixteens". First - take 8 of them and set them aside -you will use these later. 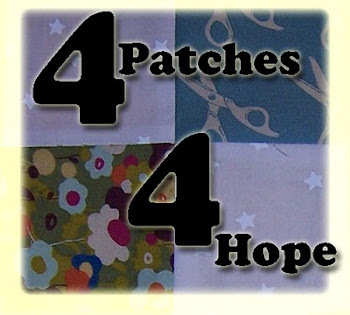 You will now be working with 64 "cobblestone" four patches and assembling them into "sixteen patches. The easiest way to chain piece these is to stitch them into pairs (64 = 32 pairs), and then stitch those 8x4 block rectangles together into 8 block by 8 block squares. You can be as regular or as random with these as your style, and fabric choice, allows. You will end up with 16 of these new blocks. Please note - these blocks will NOT be the same dimension as the "eye blocks." They will be smaller. They should be 6 1/2" square.